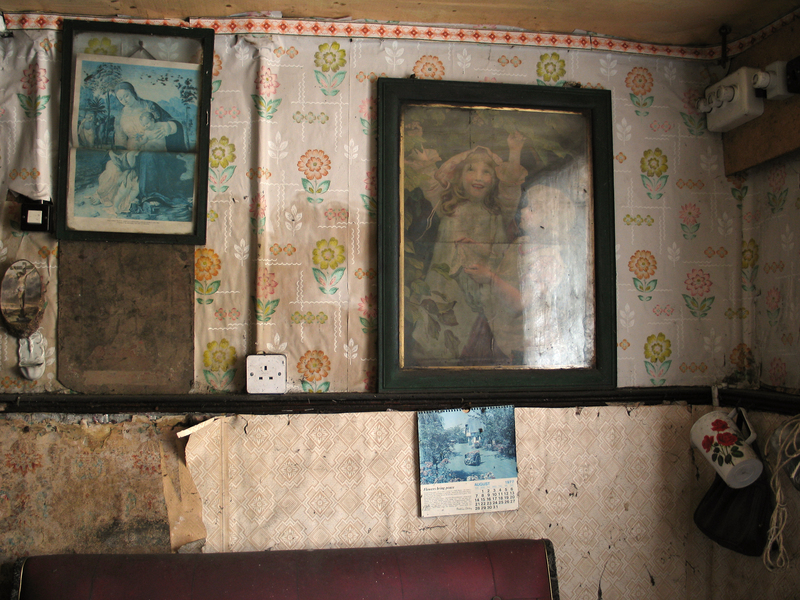 The kitchen viewed from the forge (Digital Photograph: Brian Mac Domhnaill, June 2005). The kitchen was accessed via the forge and was the smaller and narrower of the two rooms. Kathy Buckley fulfilled a management role in the family business and the kitchen was where she held fort. The lack of division between working and living space would have made for a dynamic atmosphere to say the least. The kitchen had one south-facing window, which was always open during the day as long as the weather allowed it. Kathy would sit by the window and keep an eye on what was going on out on the street, sometimes kneeling on the table for a better view. On one occasion she had learnt from a number of people returning from the market down the road that a loudmouth farmer of a miserly nature was haggling over money with the traders. She told her brothers in the forge of the character that was in town. She continued to sit at her kitchen window and possibly tipped off by a neighbour alerted her brothers to the approach of ‘the Miser’ as he came up the street. They took a hot S-hook (not red but very hot) from the forge and discreetly placed it in his path outside. He thought he had stumbled upon a free S-hook and picked it up only to burn himself. Kathy, her brothers and their neighbours were highly amused (Anecdote relayed by neighbour Ted Ambrose). The two calendars in the kitchen were open on July and August 1977, which is around the time Kathy went into a nursing home. There were a number of items of interest on the mantelpiece including two china dogs and an assortment of tins containing tea, tobacco and letters. Children would often visit Kathy to hear stories. She had the habit of feeding the fire with her hands and would later affectionately pat the kids on the head as they left. When they went home with soot on their heads their parents always knew where they had been (Anecdote relayed by Mary Deady). A dresser in the northwest corner of the kitchen contained a considerable archive of photographs, letters and other miscellaneous documents dating from the late 1800s to the 1970s. In general the kitchen was in a bad state when I found it but by all accounts Kathy lived pretty rough towards the end of her time in the house, too proud and independent to accept help, too old and frail to keep the place in good shape. This resulted in an unusual level of preservation in terms of the archive material found in the house. If one went by the contents in one drawer alone it may not have been opened since the 1940s and subsequently sealed shut by a neighbouring piece of furniture. There is both a sense of officiousness and sentimentality in her retention of certain documentation and objects. This material will feature in future posts. 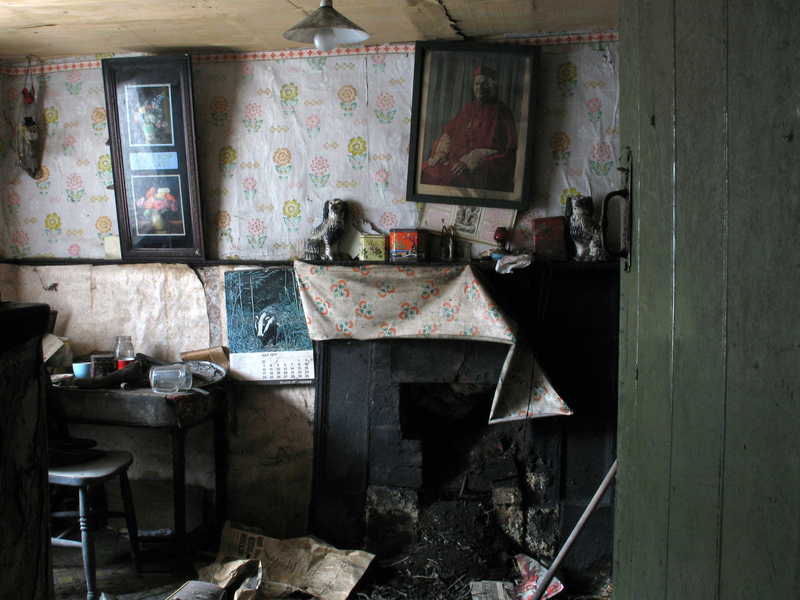 The kitchen facing north (Digital Photograph: Brian Mac Domhnaill, June 2005). 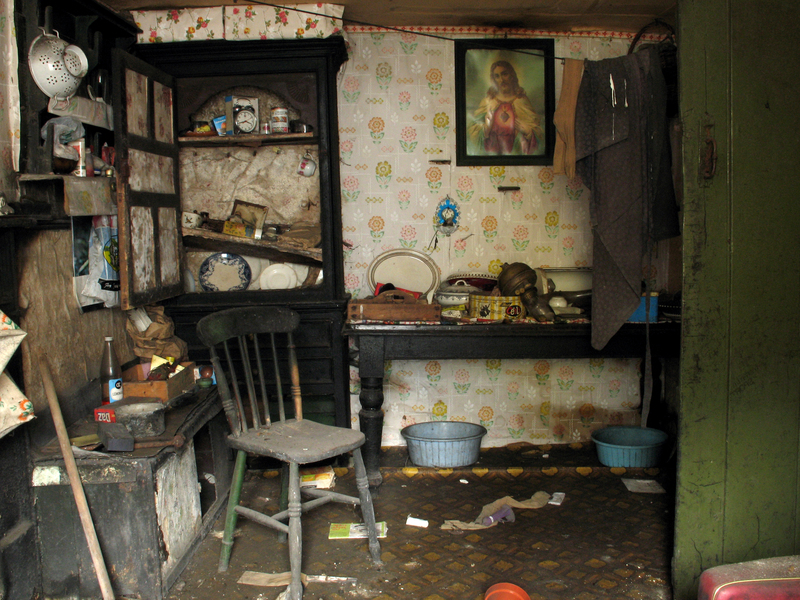 The kitchen facing east (Digital Photograph: Brian Mac Domhnaill, June 2005). Were you able to take all the photos, letters and other papers? Yes. I will be sharing them all over the coming weeks and months. All the photos are scanned as are the letters from the 1940s, which I have transcribed. There are other later letters to transcribe, mostly from the same person. I might enlist the help of some readers for that. I have scanned most of the other documents.